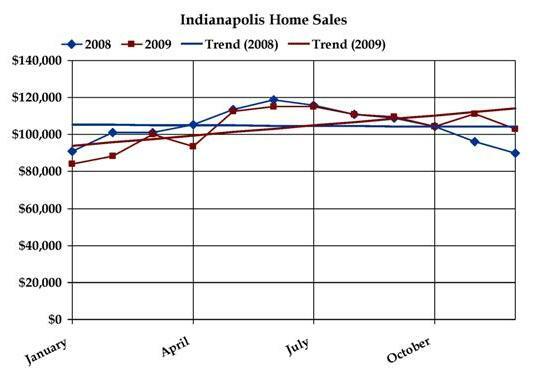 Comparing the Indianapolis real estate market from 2008 - 2009 indicates signs of recovery on the horizon. As we track the number of home sales, the first half of 2009 was well below the number of sales of 2008. In July, the sales equaled 2009 and with the exception of December. the number of home sales for the last half of 2009 exceeded the homes sold in 2008. Consequently, the average home price in Indianapolis in 2009 also stepped into pace with 2008 home prices in July and stayed consistent for the next few months. By the end of 2009, the average home price exceeded 2008 and the trend is moving up for both number of sales and the average home price. 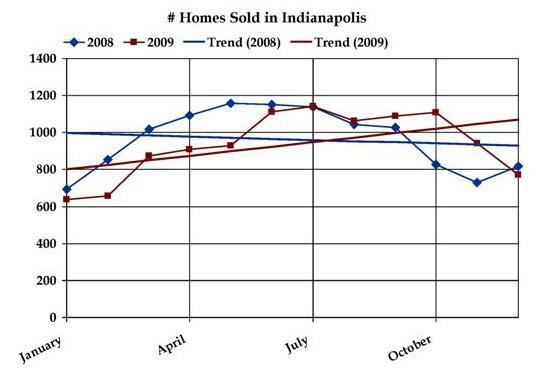 Statistical Data In 2008 there were 11,552 homes sold in Indianapolis with an average price of %106,094. Of the homes sold, 4114 were bank owned and 579 homes sold for less than $10,000. The highest price home sold in 2008 was in Lake Clearwater and sold for 2.2 million. In 2009, there were 11,244 homes sold for an average price of $105,502 and 3720 of those sales were bank owned. 469 homes sold for less than $10,000. The highest priced home sold in 2009 was in Williams Creek and sold for 1.9 million.